My kids love to dance to Michael Jackson and pretend to have a guitar like Slam. 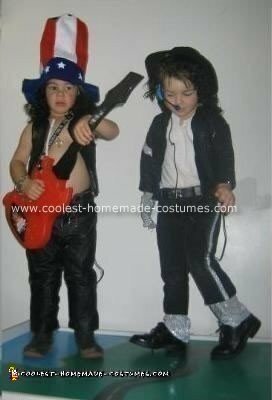 So when Halloween came they naturally wanted Homemade Slam and Michael Jackson Halloween Costumes. I couldn’t find the costumes in the store so I decided to make them. I made Michael’s jacket, glove, hat and hair, socks and added glitter fabric to the pants and darken his eyebrows, we had the headset. I took a old shirt, glove and pants and added black and white sequence to form all the cloths. I bought a hat and cut it to fit my son head and added hair and curled it to look like Michael Jackson. Eye liner is all I used to darken the eyebrows. Slam, I made the leather pants, leather vest, hat and hair, bracelet and bought him a guitar and necklace and darkened his eyebrows. I made the leather vest and the pants out of an old leather coat I had. Then I made the bracelet with an old belt and added the rest of the links to the vest and pants. Also I glued the hair on the hat and curled it to look like his and the guitar came from 7/11. You can fill it with juice. I figured I can fill it for Halloween. They love their costume and now they can dress up when they dance. Do you mean Slash? not Slam..